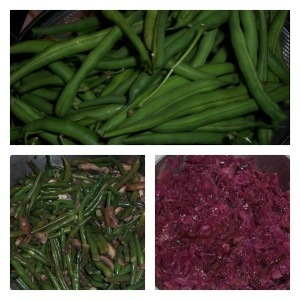 Being an Omnivore, every once in awhile I have crazy cravings for just vegetables. The plan was to go to the Farmer’s Market to pick up some seasonal veggies and just cook them up. All in all I was shooting for a veggie side dish dinner. Unfortunately, we were not able to make it to the Farmer’s Market because I worked a late shift the night before and needed some sleep. It is next to impossible to sleep in because I have 2 daughters (2 years old and 4 months old). So I am usually tired in general. Our garden finally produced some vegetables in the form of an insane amount of green beans and peppers. Granted we could have had tomatoes but the squirrels have decided to have parties in our yard and eat all of them, right before harvest (sad face). Mike pickled the jalapeños and I sautéed the green beans up with some mushrooms, garlic, and white wine. I did run to the store to pick up some red cabbage and apples because I was craving the red cabbage we had in Germany. I made some modifications to the recipe in Joy of Cooking to the Braised Red Cabbage and Apples. Most notably I did not use bacon fat, instead I sautéed everything up with olive oil. I also replaced the honey in the recipe with maple syrup. I am sure you could also replace the honey with agave syrup. This weekend we are definitely going to the Farmers Market, so I will remember to take pictures of all the lovely produce. This weeks Tuesdays With Dorie is being hosted by Gaye of Laws of the Kitchen. 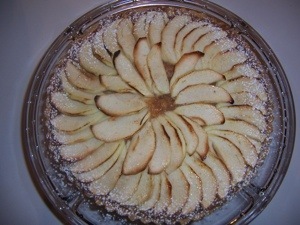 She is hosted the recipe for the French Apple Tart which is located on pages 379-381 in Baking With Julia. I actually made this Tart for dessert last night and it turned out great. I had some left over pie dough already portioned out in the freezer, so that made this recipe a little bit quicker for me to accomplish. For the filling, instead of baking the apples in the oven I decided to cook everything in a pot on the stove and it turned out perfectly fine. It actually reduced the amount of dishes that I had to wash since I cooked and mashed the apples in one pot. 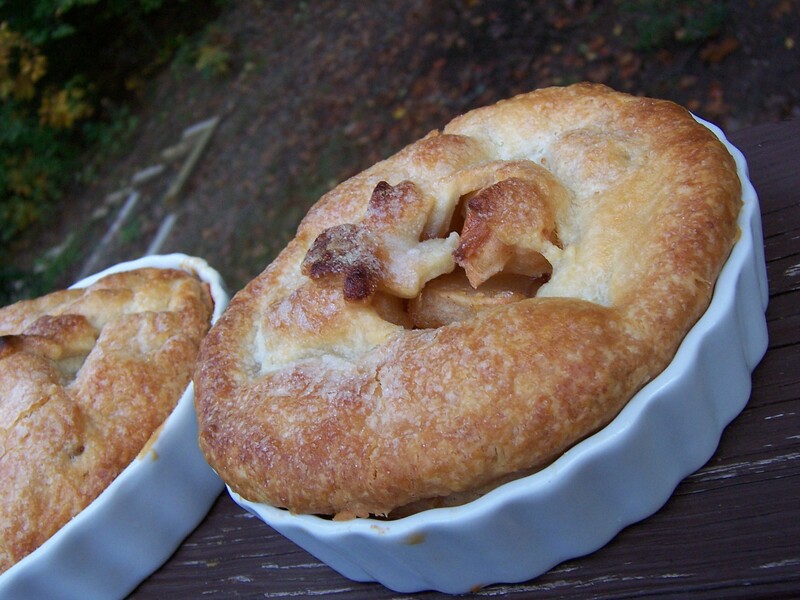 To make the taste of the apple filling a little bit more flavorful I used 1 tsp of cinnamon instead of just a pinch. The tart reminded me of a nice slice of apple pie, and both Mike and I enjoyed it. I would definitely be willing to make this tart again. Especially, when I really want an apple pie that I know will turn out great. This weeks Tuesdays with Dorie was chosen by Katrina of Baking and Boys. 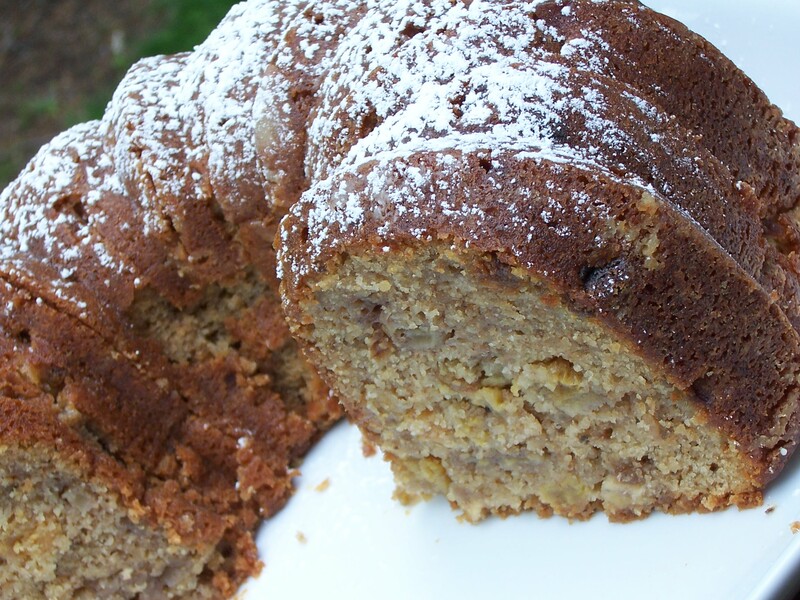 She picked Dorie’s Apple Nut Muffin Cake which is located on page 37 in Baking:From My Home to Yours. 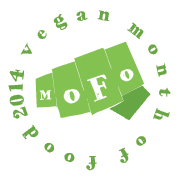 Since this month is Vegan MoFo aka Vegan Month of Food, all of my post for October will be Vegan. If I am given a recipe that is not vegan than I will make it vegan to abide by the rules, which I did for this recipe. This cake turned out wonderful. No one would be able to tell that it was vegan. 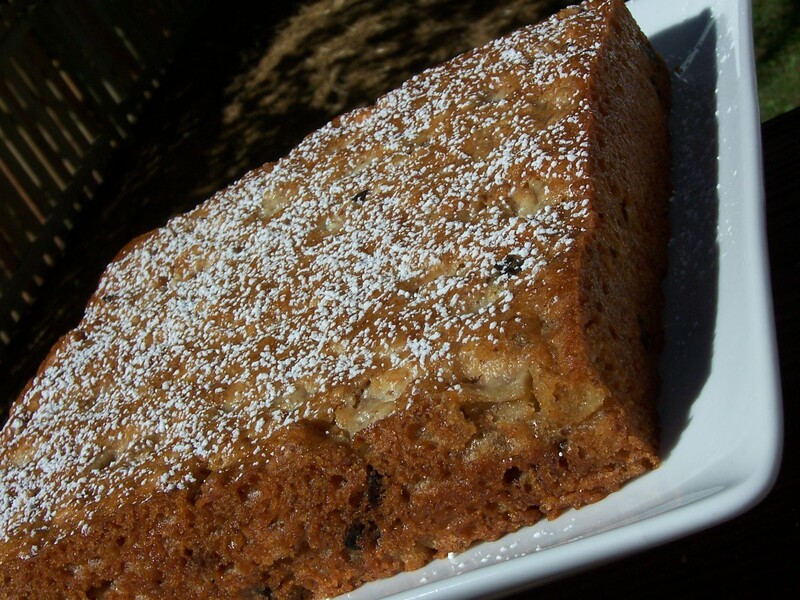 It was very moist because of the apples and the texture reminded me of a banana walnut cake without the banana flavor. I would definitely make this again. The changes to the recipe that I made were very easy, and actually made for a healthier version of the cake since I used vegetable oil instead of butter. I took a few hints from the Ladies over at Post Punk Kitchen via Vegan with a Vengeance to make this recipe Vegan and it was perfect. You can find the original recipe on Katrina’s blog, Baking and Boys. Below is the vegan version that turned out FANTASTIC!!! Getting ready: Center a rack in the oven and preheat the oven to 400 degrees F. Use an 8-inch square silicone pan, or oil an 8-inch square baking pan. Put the pan on a baking sheet. Whisk together the rice milk, cider, ground flax seed with water, vanilla and pecan extracts, oil, and vinegar. In a large bowl, whisk together the flour, sugar, baking powder and soda, cinnamon and salt to combine thoroughly. Toss in the brown sugar, making sure there aren’t any lumps by running it through your fingers, then add the oats and whisk the dry ingredients a few more times to mix. Switch to a large rubber spatula and stir in the liquid ingredients, stirring just until everything is moistened—as with muffins, less mixing is better than more. Gently stir in the apple, nuts and figs, and scrape the batter into the prepared pan. Bake for 30 to 35 minutes, or until the cake is golden brown and a thin knife inserted into the center of the cake comes out clean. Transfer the pan to a rack and cool for a couple of minutes before running a knife around the sides of the pan and unmolding the cake; invert and cool until warm, or to room temperature. This weeks Tuesdays With Dorie was chosen by Emily of Sandmuffin. She picked Dorie’s All-American, All-Delicious Apple Pie which is located on pages 300-302 in Baking: From My Home to Yours. Yes, I know today isn’t Tuesdays. In between making the cheesecake, I made the pie crust and kept it refrigerated. 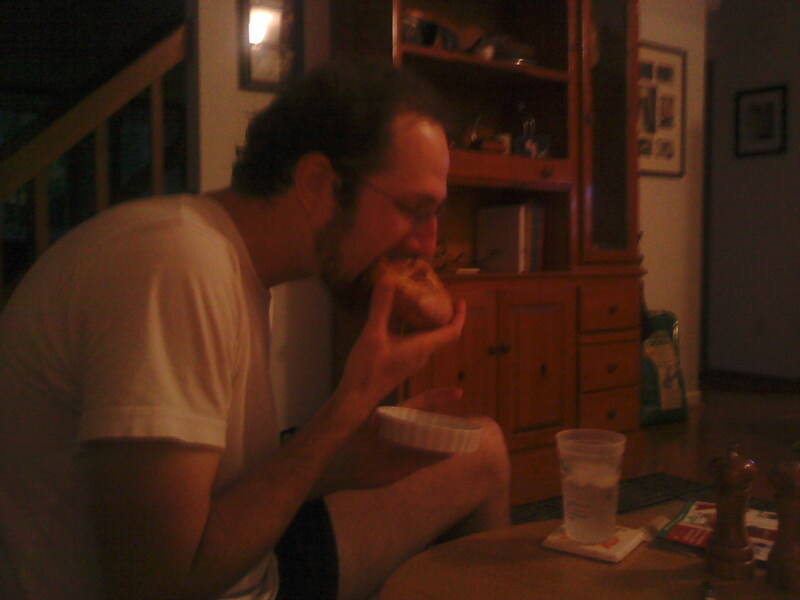 Once the cheesecake was finally out of the oven, I went to finishing up the apple pie. For this recipe, I actually only made 1/6 of the recipe which makes two perfectly sized mini pies. While mixing the ingredients together for the filling, I discovered that I had either misplaced my tapioca or actually used all of it and never realized it. So I went to my old pie standby, cornstarch. The pies baked up in 40 minutes and as you will see from the picture of Mike, they slipped perfectly out of the ramekin and turned into a hand held apple pie 🙂 I had a couple of bites of Mike’s and the pie was great, and now I can say I have actually made a really good Apple Pie which has been a goal for me for a long time. Thank you Dorie and thank you Emily for picking this recipe. This weeks Tuesdays with Dorie was chosen by Lynne of Honey Muffin. 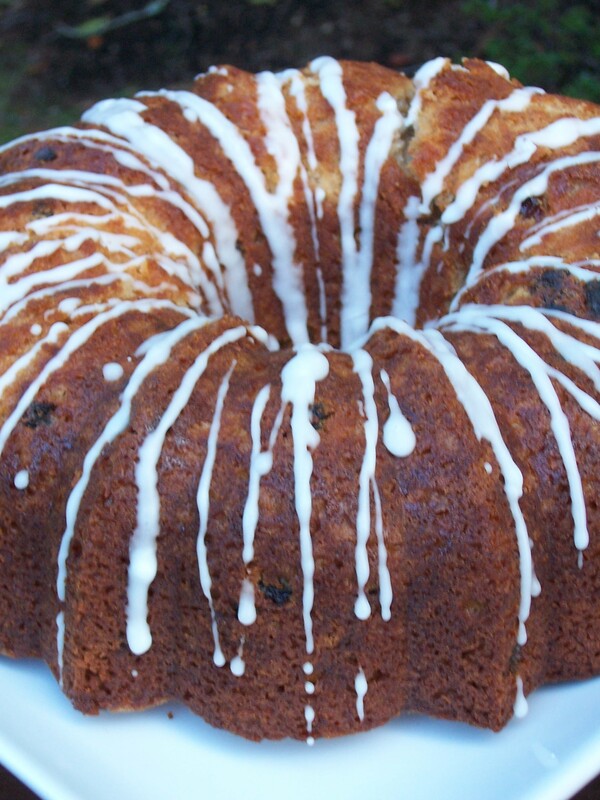 Lynne picked Dorie’s Double Apple Bundt Cake, which is located on pages 184-815 in Baking: From My Home to Yours. This weeks Tuesdays with Dorie was chosen by Leslie of Lethally Delicious. She picked Dorie’s Tart Fine which is located on pages 315 in Baking: From My Home to Yours. The recipe was simple and straight to the point. 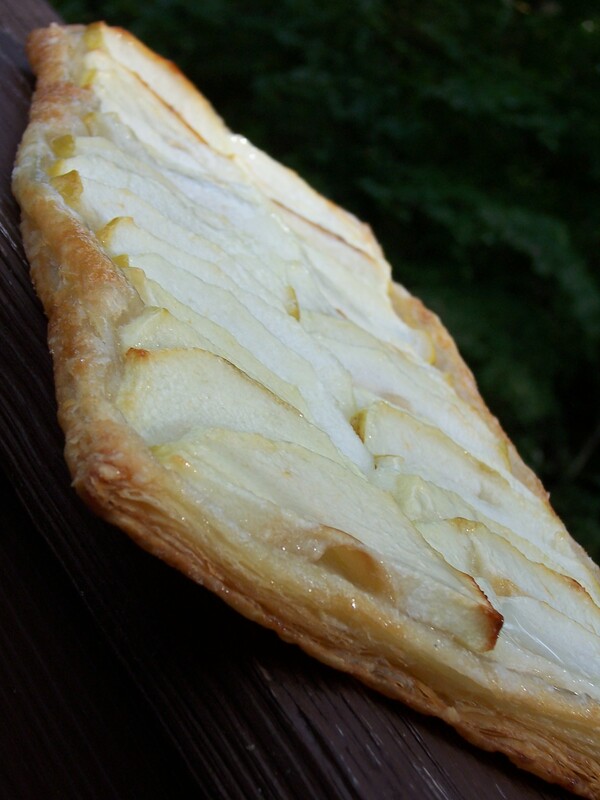 All it really involved was puff pastry and apples, which I happened to have some homemade puff pastry in the freezer so this was right up my ally this week. It turned out pretty and it was yummy. I big thanks goes out to Leslie for picking this.